Peace Mala is a unique, multi award winning educational project which provides a complete, effective and innovative answer to all the requirements of the Government's ESDGC directive (Education for Sustainable Development and Global Citizenship). 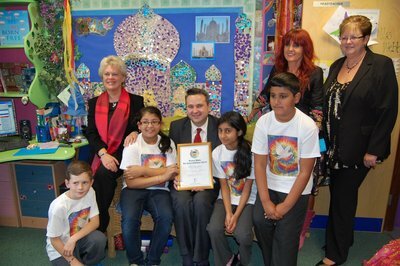 The photograph here shows Hafod Primary School, Swansea receiving their Peace Mala Accreditation Certificate from Huw Lewis AM, then Minister for Education and Skills with the Welsh Government. Peace Mala Accreditation is not an 'add on' extra-curricular activity. It can be delivered through the existing curriculum involving change in emphasis rather than new work. Peace Mala Accreditation is a cost effective initiative which provides teachers and leaders of youth and community groups with the keys to educate and equip children and young people with necessary life skills through engaging in cross-curricular activities focusing on seven separate but related areas. 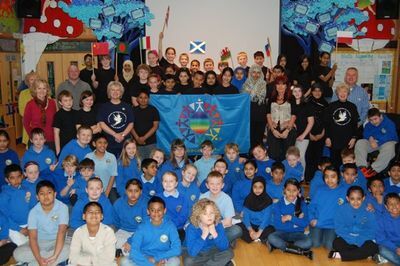 Community cohesion and global citizenship: using the Golden Rule, "Treat others as you would wish them to treat you", as a focus to encourage positive relations between young people, their plural community and international cultures. Needs and human rights: emphasising to young people their rights and those of others, and how these rights prevent bullying and all forms of prejudice. Interdependence: stressing that how we behave in life affects everyone we meet and how an awareness of this can help create a better world. Active compassion: advocating that learners will make wholesome changes locally and globally, and become positive example to their peers. Celebrating diversity: creative, innovative celebrations which include the involvement of local cultural communities, such as faith and ethnic groups. Environmental responsibilities and sustainable change: promoting environmental sustainability, healthy eating, and respect for all animals and wildlife. Conflict resolution and peace education: engaging learners in peace focused-activities which encourage conflict resolution. We have a PowerPoint Presentation explaining the benefits of Peace Mala Accreditation available from our DropBox account here. By engaging the minds of children and young people with Peace Mala educational activities at 'grass roots' level, we have great hope of helping to create a more responsible, caring and compassionate society. Education is the key to bringing about positive changes in behaviour and attitudes. Peace Mala is a powerful and effective educational tool which helps make this happen. Many schools and groups are already engaging with initiatives that fit with our accreditation guidelines and have found that Peace Mala involvement enhances their efforts. 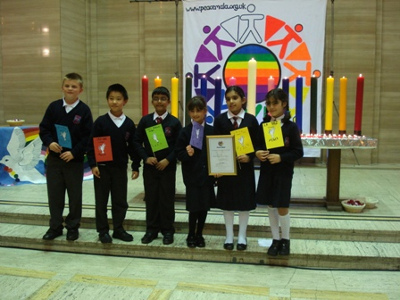 Here is an interview Pam Evans gave to the Good Evening Wales programme on the importance of good religious education in schools. 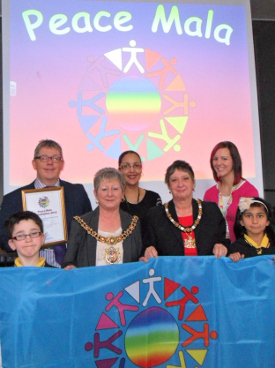 Our school is a multicultural haven for the children of Hafod where we celebrate our differences and live in harmony. Peace Mala is central to what we do. 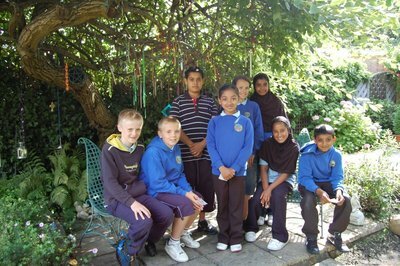 The project work that we have undertaken with Peace Mala has made a huge difference to our pupils, staff and parents. Relationships between staff and parents have improved and this has made an impact on the community. Children understand and display tolerance, respect, kindness, understanding, friendship, hope, honesty, peace and unity. Everyone feels included. 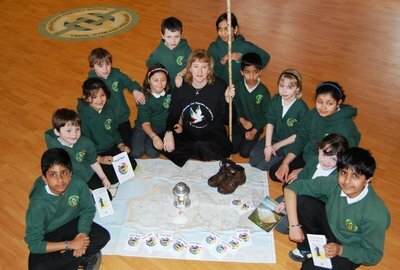 Our Peace Mala journey is a whole school one. 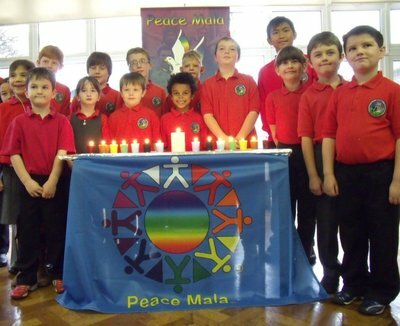 Penllergaer Primary shares the spirit and message of Peace Mala. 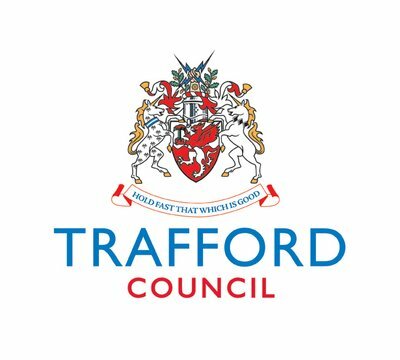 One of our aims is to create a safe and stimulating environment where all our children feel included and valued and learn respect and tolerance for other people. Peace Mala has given us an avenue to engage with others. 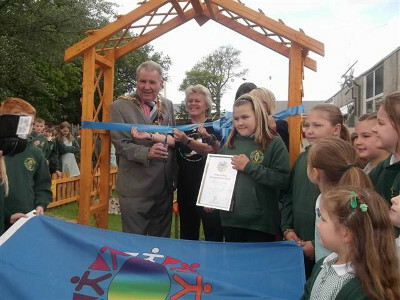 Support from the community and various groups have enriched our children's experiences. 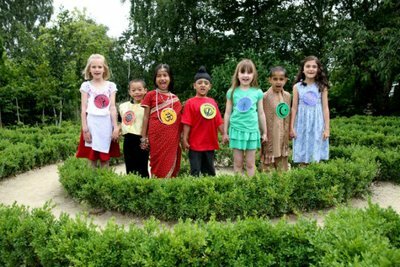 Being a Peace Mala School is a reflection of what we are about and allows us to share common ideals and principles. Our children are our future. If they are instilled with sound values and equipped with the skills needed for lifelong learning, then we hope they will continue the journey for us. From the moment I laid eyes upon the Peace Mala bracelet, I knew that this was something very special, the missing link in education, the 'glue' that would bring together everything that we, as educators of tomorrow's global citizens are striving for. 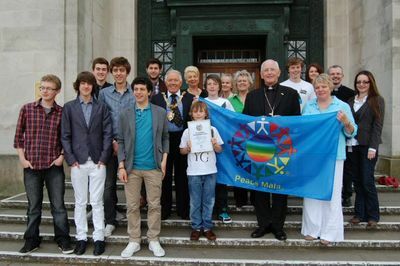 Being a Peace Mala School has transformed our lives and provided amazing opportunities for our pupils, including participation in October 2010 in the Peace Mala Festival of Interfaith and Culture for Education at Gorton Monastery on the Feast of St Francis on behalf of Greater Manchester Schools. The aims of Peace Mala fit exactly with the school ethos where children and staff work hard to treat one another with respect, where we celebrate festivals from different cultures and religions and encourage tolerance and appreciation of what each of us has to offer. Peace Mala has been an excellent focus for our work on bullying, prejudice and the environment and for our international school links. Catwg is proud of its inclusive ethos and we feel that the Peace Mala message fits perfectly with the work we do in school promoting peace, friendship and respect in celebrating diversity. The Peace Mala message is simple - we are part of a world community where everyone is unique and special. We all deserve to be treated with respect and to live in peace. We are looking forward to continuing our Peace Mala journey and sharing its message to help build a better world. This project is a key element in supporting the interfaith dialogue for peace ... it is well timed given the current rise in terrorism in the name of religion. All faiths focus on the importance of caring for all living things and working towards a peaceful society where all beliefs are recognised and accepted. The Peace Mala Project reflects these principles and these same principles underpin all of our work in schools in developing young citizens of tomorrow.